Today’s “get to know” interviewee might be best known as the ‘Ribbon Lady’. An accomplished historical costumer, she inspires everyone around her to fall in love with vintage textiles and trims and to appreciate the stories they carry. Please welcome Susan. My name is Susan, though I also answer to ‘Ribbon Lady’. I think it’s been 18 years. Since I was a very small child. As a toddler, I started with a yarn needle (my mother would thread it for me) and I would sit and sew for hours. I can hardly remember a time when I didn’t sew. Handwork and historical costuming, though to me they are one and the same. 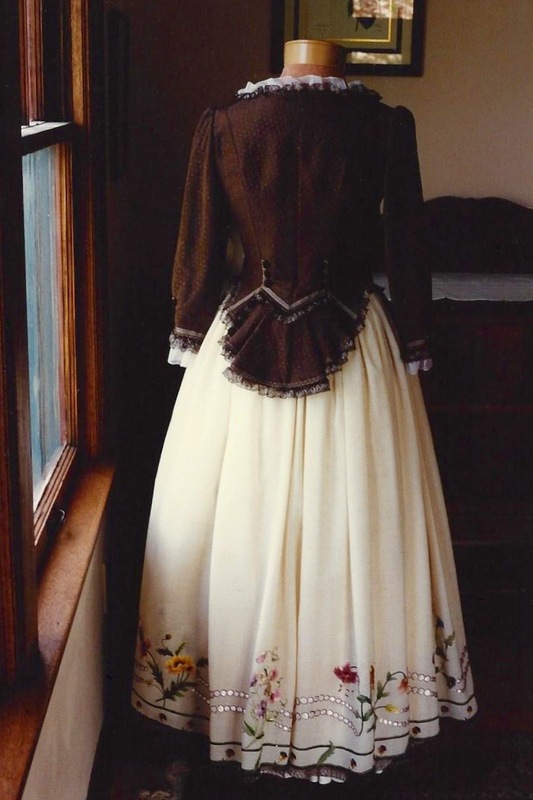 I’m interested in basically all costuming eras aside from the 1840s, 1850s, and 1860s. 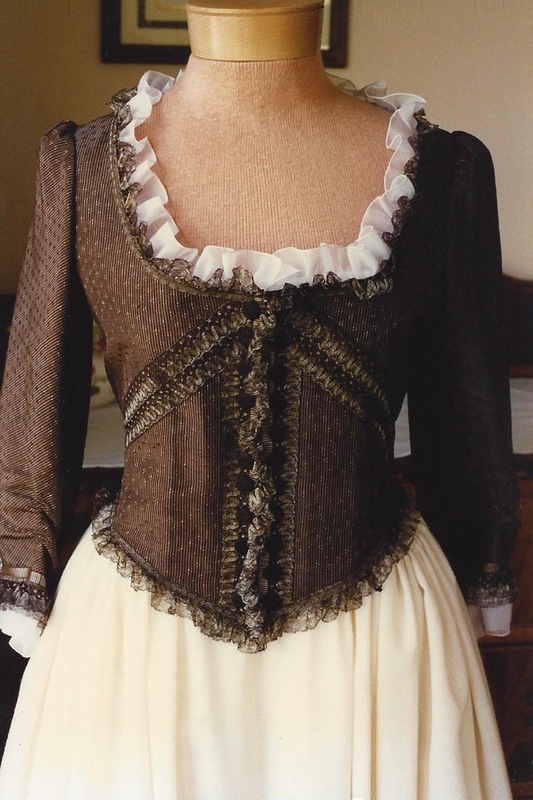 My favorite costumes to create are from the 18th century and Edwardian eras, as both are suited to lots of handwork. Where 18th century styles have fairly simple construction, Edwardian construction is a bit more challenging, which I enjoy. 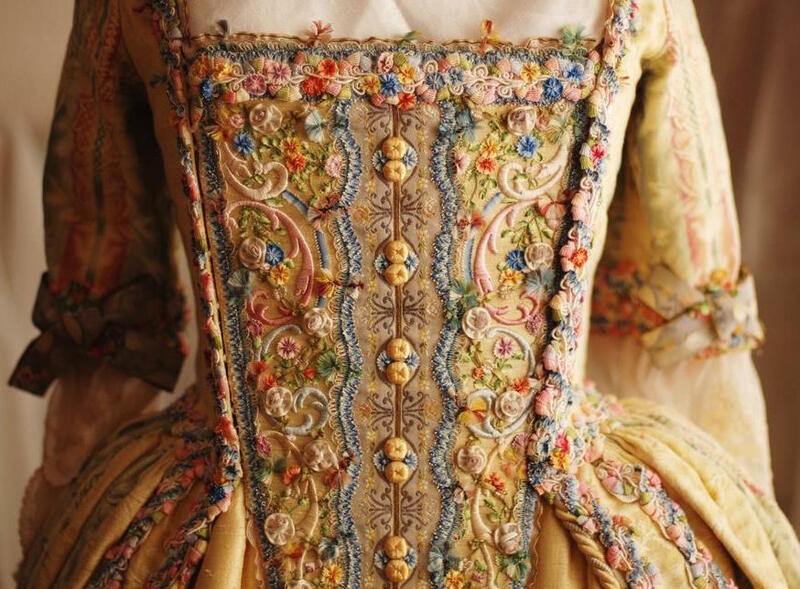 The design and color palette for this c.1755 style gown was inspired by the small piece of antique fly fringe at the top of the stomacher. My costuming process begins with my collection of textiles and trims. It is a slow process; I collect items and create kits of fabric and trims. I use mostly antique and vintage trims, as antique yardage is more difficult to find and more fragile. 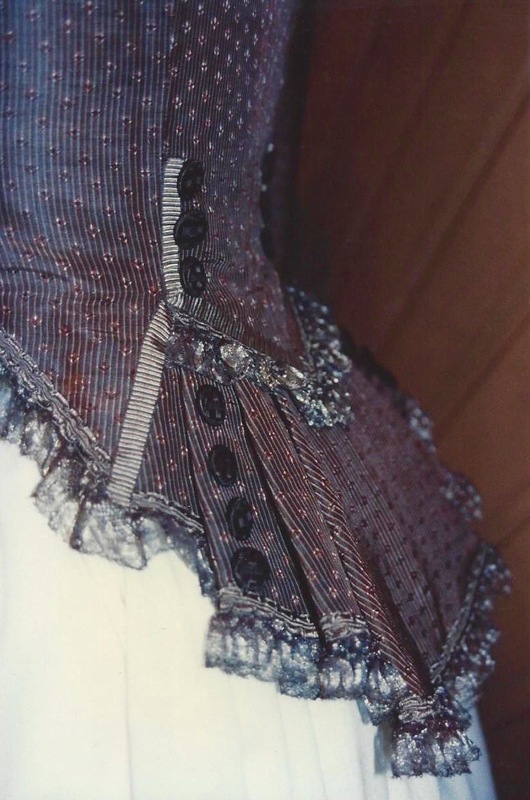 The starting point for a given costume is usually a single item, like a button or a trim; sometimes it is a tiny piece of 18th century fly fringe, sometimes it is a piece of fabric from the 1920s. 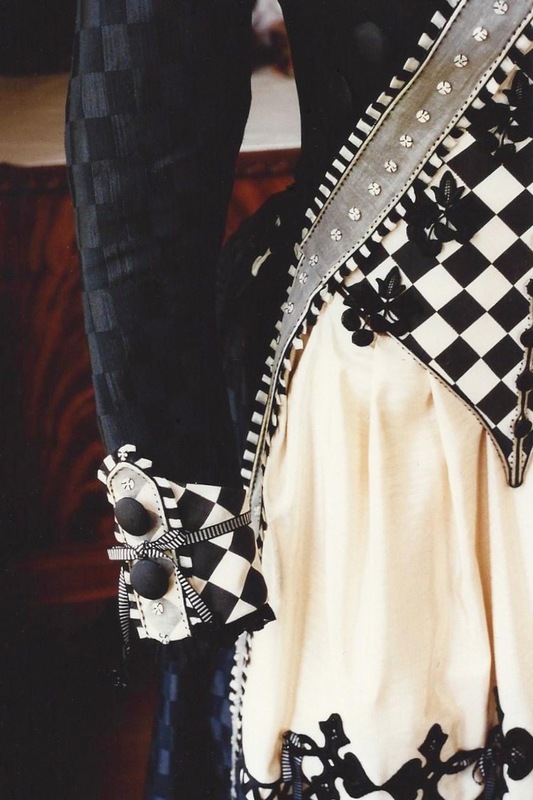 A black-and-cream checkerboard fabric from the 1920s and vintage cherry motifs inspired this 18th century costume with harlequin details. The first true project was sewing doll clothes. I had very well dressed dolls, in many eras of historical costume. 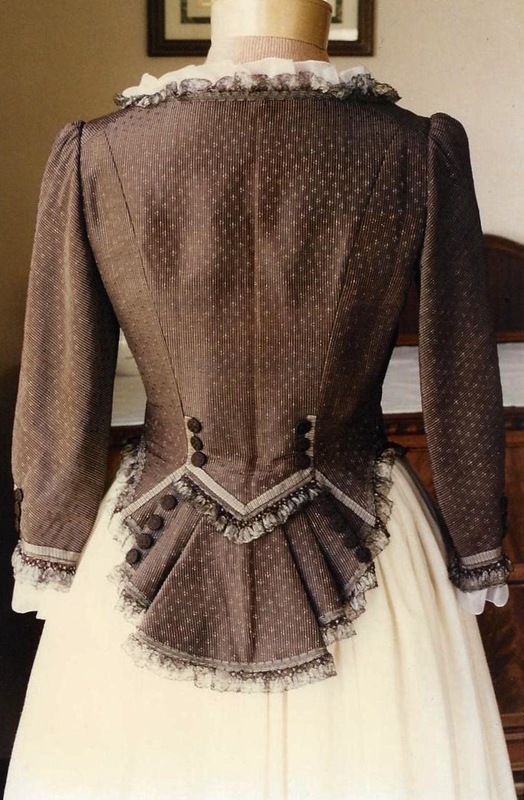 Sewing and historical costume go hand-in-hand for me; the clothing of other eras has always been of more interest to me than the clothing I could see on the street. An Edwardian ball gown skirt, made in silk brocade with antique butterflies and antique Art Nouveau trim. The silk brocade is a very deep navy blue, the butterflies are black backed in gold metallic fabric with a slight pleat; it is a moody and mysterious color palette. I’m still working on the bodice that goes with it. 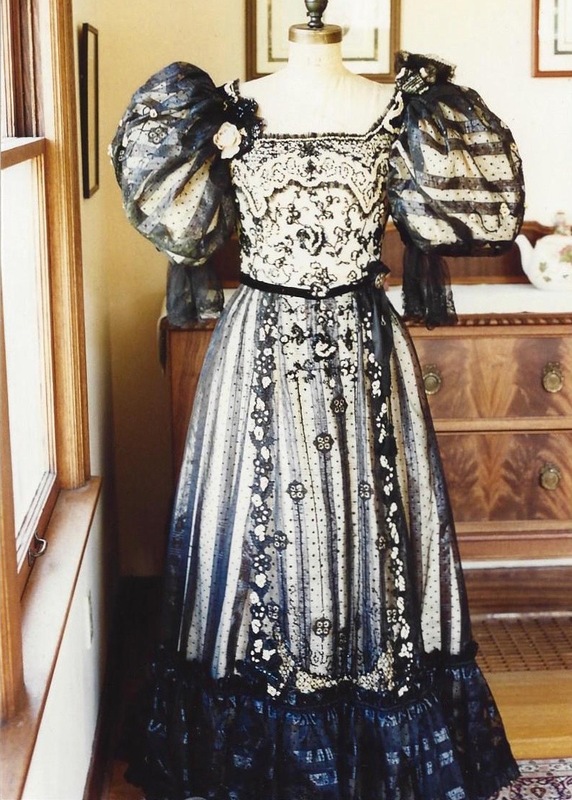 One of Susan’s completed Edwardian ball gowns, a true 1901 shape. Her recently completed skirt and soon-to-be finished bodice have a similar silhouette. 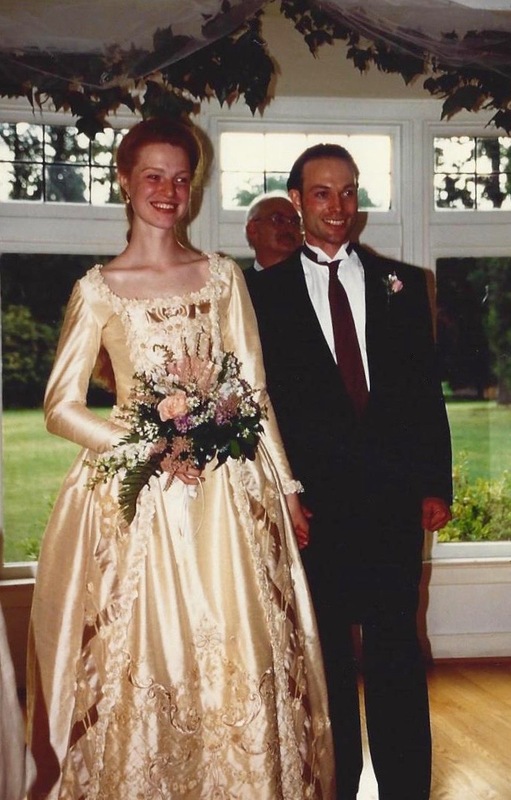 The most memorable project would be my daughter’s wedding dress. When I started making it, I believed I had six months to complete it. Then she was awarded an overseas scholarship that had to be used immediately, so the wedding was moved up five months. I completed it in three and a half weeks. The bride, Susan’s daughter, and her groom on their wedding day. 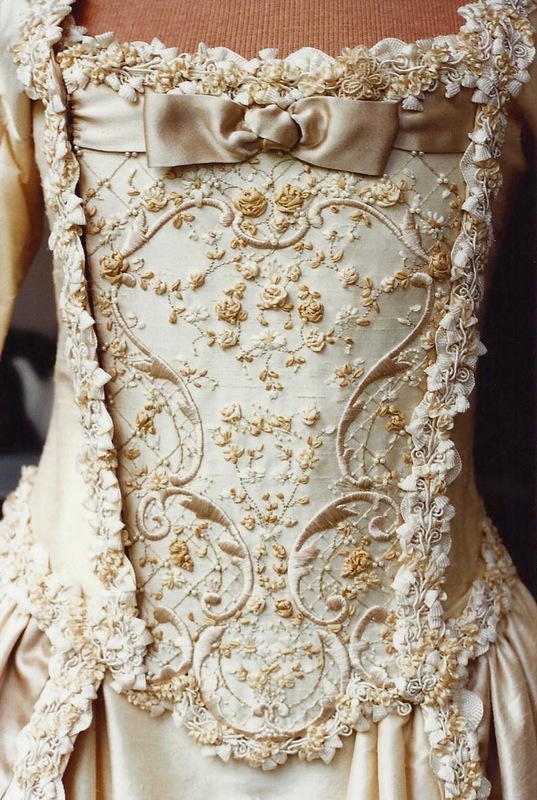 It is an 18th century style gown made in a color palette best described as ‘triple cream French vanilla’. 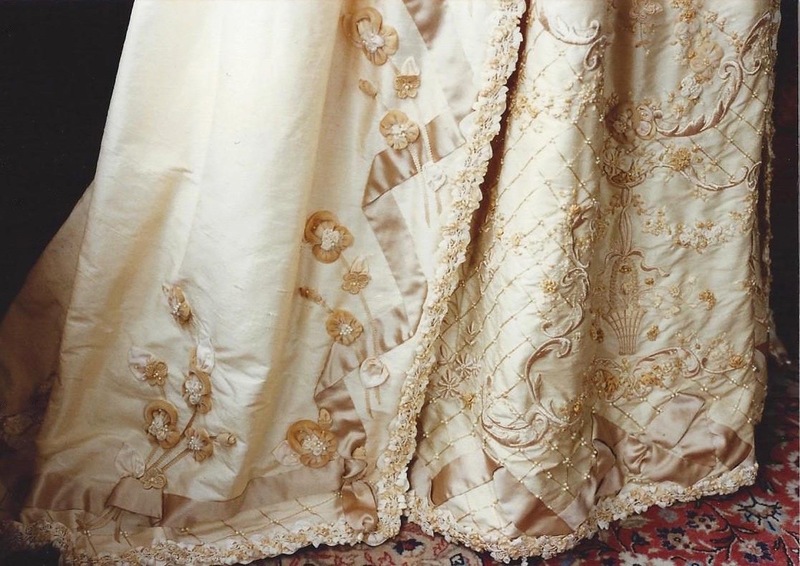 The dress is vanilla-colored silk dupioni, with monochromatic embellishment, including embroidery, ribbon embroidery, beading, and dimensional ribbonwork. Most of this dress was made with modern materials, but I did use a gorgeous antique woven tubular silk ribbon. Though the tube is flattened, it still has a lovely dimensionality. 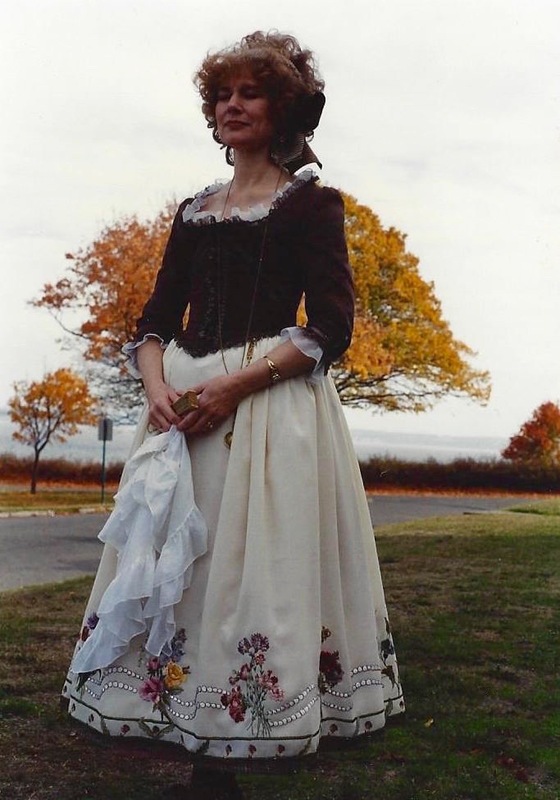 My favorite project is one of the two things that I made without a deadline: an 18th century ensemble.The skirt was made of cream-colored wool challis, which I embroidered using antique thread. 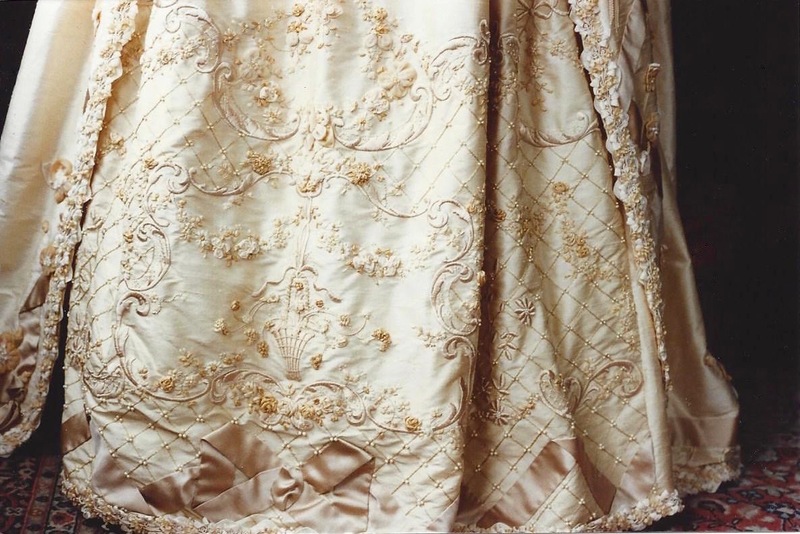 Some of the embroidery – a double wave of pearls winding around the skirt – was inspired by something I saw on an 18th century skirt. 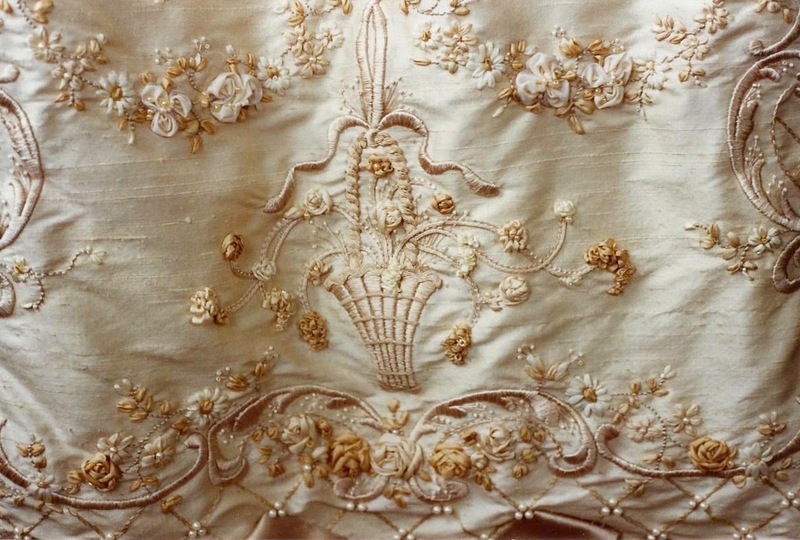 The floral motifs were informed by the availability of colors in the antique thread. My mother was a florist and I spent lots of time in her shop when I was young; I used my memories of different flowers to create the motifs, which include lilies of the valley, pansies, forget-me-nots, sweet peas, tiger lilies, anemones, and morning glories. Because I didn’t have a deadline, I was able to spend time experimenting with the flowers. It was lovely. To coordinate, I made a Pierrot jacket using an incredible antique 18th century silk fabric in brown with a woven stripe. I trimmed the jacket with white silk organza ruffles, two 18th century metallic trims (one ruffled, the other serpentine), and ribbon and thread buttons from the Victorian era. It wasn’t the most ornate or structurally complex costume I have made, but I felt totally at home in it and it remains a favorite. At present, I am preparing for an exhibition of my costumes, which will take place November 11th through 15th at the Glenn Hughes Penthouse Theater at the University of Washington. The show will feature more than 50 costumes, ranging in date from the late 17th century (Cavalier era) through the 1920s. In terms of costume, I have several works in progress: an embroidered 1920s coat and the bodice to the Edwardian ball gown skirt, among others. I plan to finish the Edwardian bodice next. The quality of the staff and the quality of the merchandise. And the Ribbon Room, of course! The Ribbon Room and I were made for each other. Thank you Susan! We are all so excited to see your costumes on display in November. 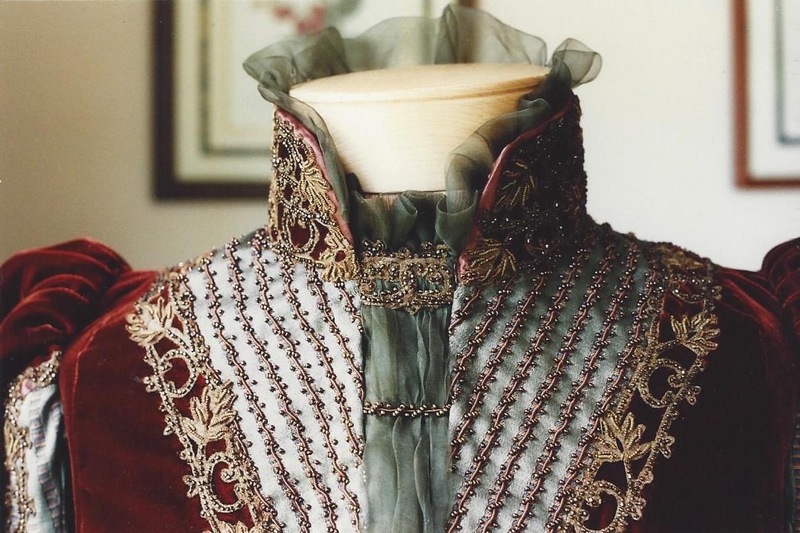 To learn more about Susan’s exhibit, including glimpses into her incredible historical wardrobe, please go to the event website: Art of the Costume. All photographs in this post courtesy of Nancy’s employee Susan and may not be used without express permission. This entry was posted in fashion shows, NSB Interviews, ribbonwork and tagged artist, embroidery, get to know Nancy's employees, handmade, handsewing, handwork, historical costume, ribbonwork. Bookmark the permalink. Wow! That’s some amazing and inspiring beautiful work! A true artist! Would have loved to see some of this art up close! Perfection, thank you for sharing.